Never mind the fact that Apple lobbed the opening 64-bit smartphone salvo nearly a year ago with the iPhone 5S - HTC plans to stake claim to a first of its own next week with a presumed successor to its Desire line. HTC revealed plans to introduce what it calls the "world's first" Android smartphone powered by an octa-core, 64-bit processor in Berlin next week. Judging from an official teaser posted on HTC's Weibo page, the event will take place a day before the annual IFA consumer electronics event kicks off on September 5, where many of the company's rivals are expect to also hold new product launches. Aside from the September 4 media event and the "world's first" claim, little else is known about the mystery HTC handset, although it's not hard to connect the dots and come to a few logical conclusions about what the smartphone maker could be up to. 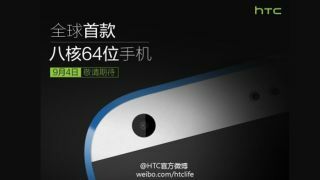 In a previous Weibo posting late last week, HTC more or less confirmed plans to introduce a new device codenamed 820, which sounds more than a little like a followup to the company's Desire 816 handset. The same post confirmed all the requisite 820 specs, including a 1080p display with UltraPixel and Duo Camera 3D technologies on board. The phone could be bound for emerging markets, if the GSM and WiMAX 4G connectivity are any indication. Needless to say, emerging markets typically nab less expensive, underpowered handsets, so it's a bit of a mystery why HTC would be touting an octa-core 64-bit chipset for a handset like the 820. We only have a little over a week to ponder what this all means, but HTC's bold claims should be worth paying attention to in the hours leading up to IFA 2014, so check back for all the details on September 4. Find out what the Sony Xperia T3 has up its sleeve in our full review!